Unfortunately, Light Cycles don’t exist in real life, but if you have ever seen “Tron”, chances are you have dreamed about owning one at some point. 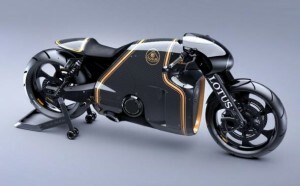 “Tron: Legacy” designer, Daniel Simon, has worked hard to incorporate many aspects of his Light Cycles into the upcoming Lotus C-01 Motorcyle. The Lotus C-01 doesn’t glow like the “Tron” bikes but everything else is similar from the silhouette to the low riding position. While technically the C-01 has the Lotus name on it, Lotus actually had no part in designing, engineering, and producing the bike. Kodewa Performance Motorcycles is responsible for making the motorcycles. The C-01 has a dry weight of 400 pounds and the bike’s frame is made out of aluminum, carbon fiber, and aerospace grade steel. One hundred of the Lotus C-01 prototypes will be offered to the public, equipped with a 200-horsepower engine and a whopping $140,000 price tag.